It was a packed house on November 17 at the Foundation Center for the Annual Bay Area Corporate Philanthropy Panel. More than 100 nonprofit professionals gathered to learn about corporate giving trends and the philosophies of some of our largest and most philanthropic Bay Area companies. The luncheon was co-sponsored by DER, Foundation Center West, and the San Francisco Business Times. 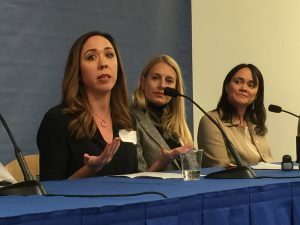 Panelists included Nicole Snow, Senior Manager, Oracle Giving and Oracle Education Foundation; Blair Blackwell, Manager of Education and Corporate Programs at Chevron Corporation; Amy Millington, President, eBay Foundation; and Stephanie Isaacson, Director of Community Relations, PG&E. When asked about the overall culture of giving at their companies, a common theme was partnerships and employee engagement. Each of the panelists stressed that it’s a priority to support organizations where their employees are involved and to engage company employees in charitable decision-making. Each of the panelists also said that they strive to develop ongoing relationships with the organizations they support, rather than just giving out dollars. To develop effective partnerships they seek to fund organizations whose mission aligns with the company and the corporate culture. Partnerships also rely on open communication and listening on both sides. Ms. Blackwell stressed that nonprofits need to be honest with their funders and not let funding dictate what you do and how much you take on as an organization. Corporate funding priorities are most often related to corporate and community interests. For example, Ms. Millington said that at eBay, their philanthropy is authentically tied to what they do as a company; so much of their giving is dedicated to supporting entrepreneurship. 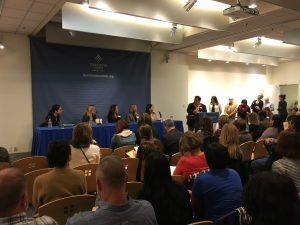 To initiate a relationship with a company, the panelists recommended that nonprofits start by engaging employees in projects and volunteering at your organization. Other recommendations include seeking out employee matching gifts and contacting the local office of the corporation. Ms. Millington also suggested that organizations set up an eBay charity platform on their website at www.charity.ebay.com.